The labelling of electrical appliances has helped in making energy efficiency people centric and aided in propagating the concept. Moreover, the Bureau of Energy Efficiency has been working towards taking the sector to a new level and is promoting super efficient appliances in this regard. Presently, the market is flooded with a wide array of electrical appliances, prominent among them being air conditioners, refrigerators, tubular fluorescent lamps and televisions. With a surge in energy consumption, it is imperative to use super-energy efficient models which would help in reducing the electricity bill. It is estimated that in the next decade, with an increased use of super efficient appliances (SEA), there would be a three-fold reduction in the electricity bill. 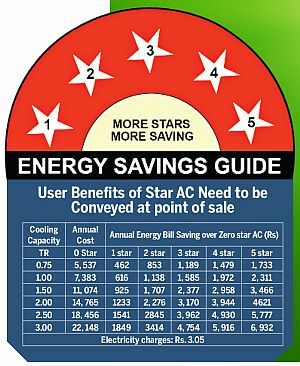 An energy efficient appliance is indicated by the number of stars (in colour) on the product, ranging from one star to five-star. BENEFIT: Some of the advantages of purchasing star labelled electrical appliances are that it helps the consumers reduce energy bills, causes a decline in the capital investment in energy supply infrastructure, strengthens competitive markets while meeting climate change goals and reducing urban/regional pollution. According to the National Productivity Council, the star rating has boosted the sale of efficient electrical appliances in India. Sustainability should be the bedrock of fulfilling the ever increasing demand for housing in urban India and this can only be ensured through green buildings. Burgeoning population, cluttered cities and metropolitans leading to an increase in the waste of natural resources prompted the government to give a serious thought to the concept and construction of green buildings in the country. Despite the global economic slowdown and sky rocketing demand for energy, experts believe that the need of the hour is to construct smart buildings, which from their very inception, help save energy, environment as well as money. The Indian Green Building Council (IGBC) vision for 2025 has aimed to create a sustainable environment for all and facilitate India to be one of the world leaders in a sustainably built-environment. HURDEL: Despite the growth in the green building movement, there are certain hurdles which are obstructing its pace. Since the laws are not mandatory, the builders do not follow the regulations and allied guidelines.” one of the major hurdles in the implementation of the ECBC is that there is no uniform and practicable building energy code, especially for those with passive and solar designs and due to a lack of knowledge, many architects and builders in India consider green building as time consuming and expensive vis-a-vis the conventional ones. 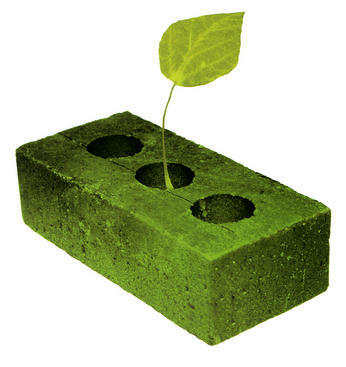 BENEFIT: Procuring the building materials and re-using them would help in the reduction of greenhouse gas emissions as there would be a drastic decline in the need to extract, process raw materials and then transport them. The re-used building material helps in reducing the adverse impact on the economy as well as on the environment from waste disposal such as greenhouse gases produced from decomposition and negates the need for new landfills. Among the old buildings, which received a facelift and have become greener than earlier are Mahindra Towers in Mumbai. Moreover, the Planning Commission is mulling for a major retrofit of the Yojana Bhawan in New Delhi to save energy and cost, apart from setting an example for government building retrofits. 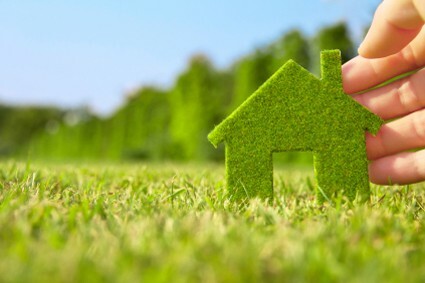 Apart from commercial spaces, the concept of greener homes is also gaining ground in the country. The need is to integrate green buildings in the larger framework of water and sanitation infrastructure, wherever possible. The need to start with a fact-finding mission to understand the needs of the communities, identify suitable technologies to fit those needs, calibrate a policy mechanism to encode it into law and finally, implement that law. “The Residents’ Welfare Associations (RWAs) and Co-operative Housing Societies could be useful tools in the propagation of Green Building concepts”. While a Bill to regulate the real estate sector has already been placed in the Parliament, to enable an impressive and cohesive Act, its impact would be felt in a significant way not before a decade, even if it were to be implemented most efficiently.